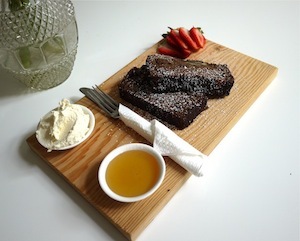 Nelson the Seagull – undoubtedly one of the funkiest cafes in town (just read Mia Stainsby’s article here) – has added a deadly new menu item to their list of offerings: Toasted To Die For Banana with a side of mascarpone and honey. The non-sweet Italian cream cheese is a dreamy pairing with the full-flavored sweet and salty banana bread. You can sweeten it up further, if you like, with the side of honey. Nelson is the kind of spot you could lounge around (or work) at all day long. With couches, big wooden tables and a wide open kitchen, the owners have created a ‘happy place’ in the heart of Gastown.